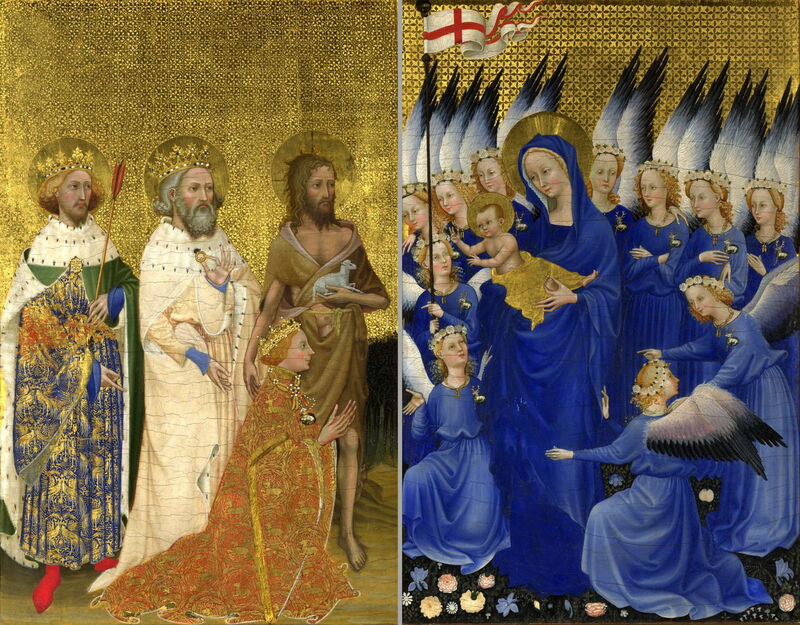 Book Review: The Wilton Diptych, Gordon et al. Note that Amazon has confuddled reviews of an old book from the National Gallery with this new book: this review is about the new book, which has only just been published. There are two paintings which anyone going to the National Gallery in London must see: Vincent van Gogh’s ever-popular Sunflowers, and the Wilton Diptych. In case you missed the latter, it is a small work on a pair of oak panels, displayed in a case in the Sainsbury Wing. Around it are the most stunning works of the early Renaissance, some dwarfing it, but once you have seen this jewel of a painting, it will grow in your mind’s eye to become one of the greatest paintings ever made. It is also a thorough mystery. Clearly some sort of portable devotional piece, no one knows who created it. It has been quite precisely dated to the few years before 1400, but for much of its lifetime its whereabouts were unknown. Although rumoured to have been owned by King Richard II of England, there is no documentary evidence of its commissioning or creation. 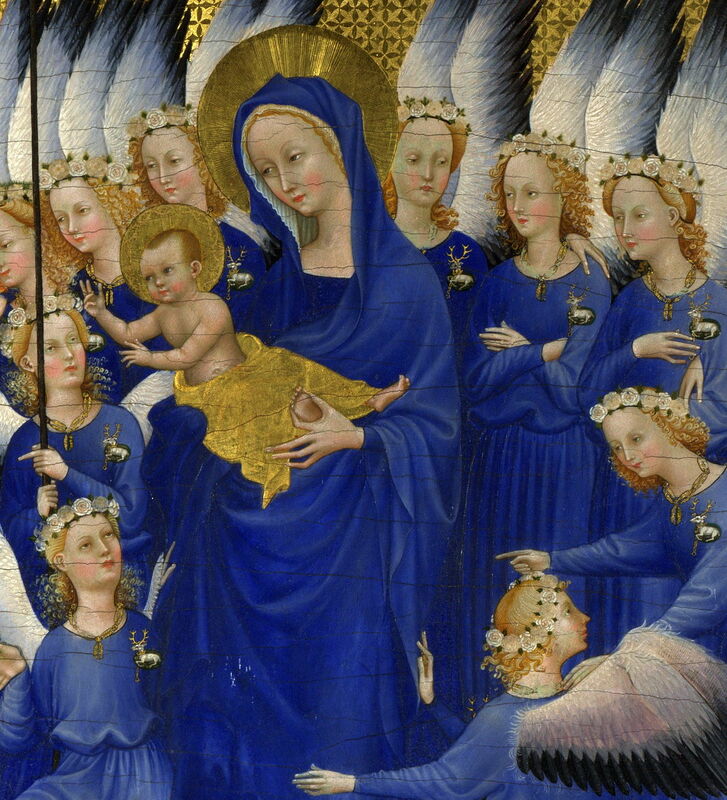 Painted in egg tempera with extensive gold work, over 600 years later it is in exceptionally good condition, its rich ultramarine blue and intricate gold as dazzling today as they must have been when it was first made. This book is the first comprehensive account in English of this important work, and draws on conservation work undertaken in the 1990s, recent examination and analysis, and modern scholarship. At least some of the answers lie in its brutal historic reality, the concern of the first chapter, by Caroline M Barron. Here we read of the painful and often tragic life and times of a king who was crowned at the age of ten, in a country still struggling to recover from the devastation of the Black Death. His wife, Anne of Bohemia, died childless when he was only 27, and Richard himself was deposed just five years later, and left to starve to death. Anonymous, The Wilton Diptych (detail of inner left panel) (c 1395-9), egg tempera on panel, each panel 53 x 37 cm, The National Gallery, London. Wikimedia Commons. Gordon considers the meaning of the four panels (two outer, two inner) in the second chapter. The interior shows on the left, King Richard II kneeling as he is presented by the three saints, Saint John the Baptist (carrying the Lamb of God), Saint Edward the Confessor (holding the ring he gave to Saint John the Evangelist), and Saint Edmund (holding an arrow from his martyrdom). On the right is the Virgin Mary holding the Christ Child with a throng of eleven angels, one of whom bears the standard of the Cross of Saint John. The many symbols present, including flowers and plants, are examined with excellent detail images including photomicrographs. Gordon points out that no one has yet synthesised this iconography into a coherent account of the meaning of the diptych as a whole. The third chapter considers the diptych as an icon of kingship, bringing together recent observations of the painting, including infrared reflectograms, with material evidence from other period works of art and objects, and history. This includes the fascinating insight into a concept of England as the dowry of the Virgin, and that as a potential explanation of the painting. Gordon concludes that Richard himself commissioned the diptych as a devotional object, for his own personal use. The second half of the book turns to thorough examination of the making of the diptych, from both the physical evidence and understanding of contemporary practice. If you have been able to see the diptych yourself and marvelled at its intricate beauty, the infrared reflectograms, detail images, and photomicrographs here will surprise you further: the naked eye cannot do it justice. This is followed by a concluding note by Martin Wyld describing the conservation work which has been undertaken on the diptych. The book itself is beautifully produced, with gold end-papers, copious illustrations including many details and photomicrographs which reveal the extraordinarily minute workings in gold, and fine brushwork. End-matter includes over 11 pages of notes with references, a seven page comprehensive bibliography (with a couple of websites too), a valuable glossary, two genealogical trees, and an excellent index. It is wonderful to review a book which is definitive, meticulously crafted throughout, beautifully executed, and a thoroughly good read. This is all of those, very well-priced, and more, and can only bring visual and verbal delight. It should be on every Christmas list, if you can bear to wait that long. Posted in General, Painting and tagged National Gallery, painting, Richard II, Wilton. Bookmark the permalink. Actually, I believe you could add to the ‘must see’ list for the National Gallery! Pierre della Francesca, The Baptism of Christ / Caspar David Friedrich, Winter Landscape / George Stubbs, Whistlejacket. The list could go on!! Yes, except that of all the many wonderful paintings there, I think that there are only two which look so completely different ‘in the flesh’. Almost every painting is worth seeing properly, but Sunflowers looks so different; van Gogh’s chrome yellow is just not reproducible in any way that I have seen. 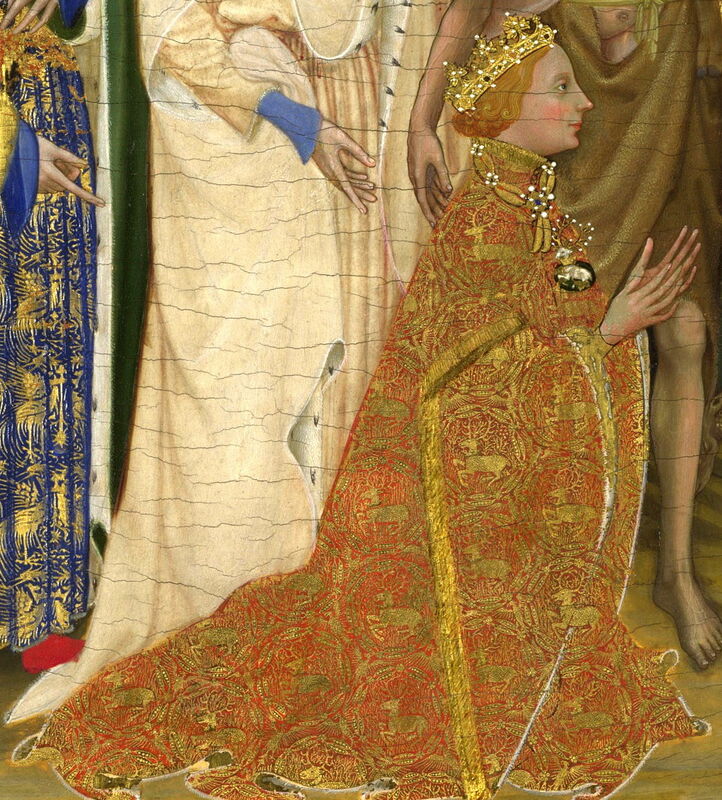 Similarly, even with the benefit of the photomicrographs in this book, there is something totally different about the Wilton Diptych ‘in the flesh’. Absolutely agree with you. The Wilton Dyptych is for me also a ‘must see’ and along with the other mentioned pictures I regularly visit. Early in the day to avoid the crowds! Thank you for the comprehensive review. I have ordered this for my daughter who majored in English history. I hope that she finds the book as fascinating as I have.